Shopping during the holiday season is stressful enough as it seems that our do to list gets longer and longer during the last months of the year. We want you to manage the level of stress you let into your life, make enough time to take care of yourself, relax, eat well, enjoy quality family time and not worry about Black Friday, Cyber Monday and shop small sales happening at various dates in November. 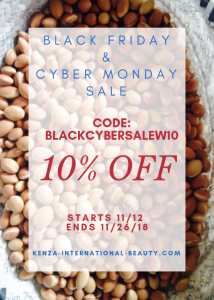 At KENZA International Beauty we offer a sale from now until November 26th, 2018 at 11:59 pm E.T. Use code: BLACKCYBERSALE20 to get 20% OFF at checkout in our Retail e-store. (Not valid on already discounted Gift packages and Travel size beauty). Use code: BLACKCYBERSALEW10 to get 10% OFF at checkout in our Wholesale e-store. 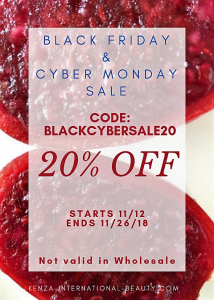 This entry was posted in Pure Moroccan Beauty Oils and tagged black friday, coupon code, Cyber Monday, gifts, gratitude, KENZA International Beauty, sale, shopping, wholesale coupon code. Bookmark the permalink.